Performers include: Jemaine Clement, Bret McKenzie, Rhys Darby, Kristen Schaal, and Arj Barker. This comedy series centers around the adventures of a two man band from New Zealand (Flight of the Conchords). 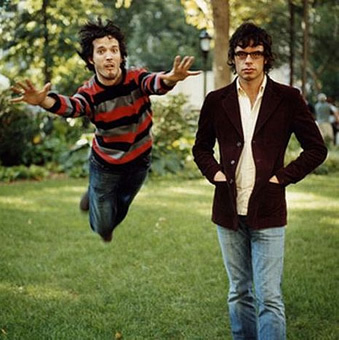 The real-life duo, musicians Jemaine Clement and Bret McKenzie, play fictionalized versions of themselves, and they created the show, along with James Bobin. Jemaine and Bret uproot themselves from their homeland of New Zealand to try and find success as a novelty folk duo in the Big Apple. They meet often with their manager, Murray Hewitt (Rhys Darby), at the New Zealand consulate. Mel (Krisen Schaal) is their lone groupie, but they keep pushing this married woman away on the advice of Dave Mohumbhai (Arj Barker), their pawn shop worker friend. The duo break into song at various points in each episode, with the songs built into the storyline in different ways. At least once per episode, a song is shown in music video form. Occasionally the other characters break out in song as well. Their enthusiastic songs provide a contrast to their lowkey lifestyles when they’re not singing.